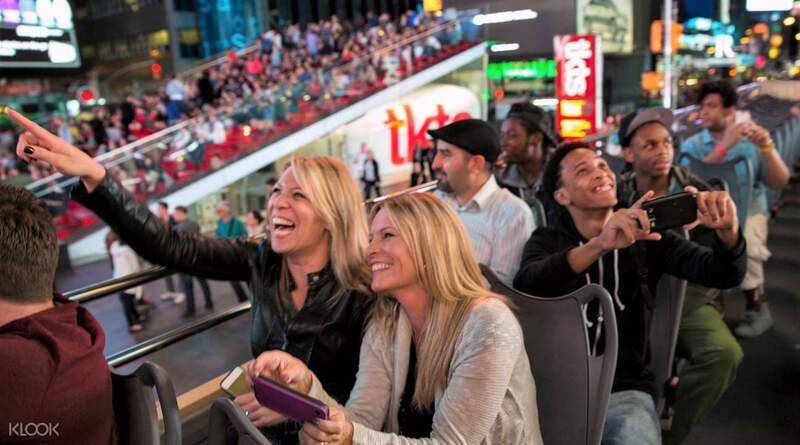 Hitch a ride on a double decker bus that will take you around iconic attractions and landmarks in the Big Apple! Good activity, but later found that the end time is 5 pm for all the routes, also there are several other hop on hop off companies at cheaper rates and more frequency, run till late( other than the night tour ). Overall, good. Tour guide was quite knowledgeable, one of them was really funny, gave some funny comparisons while doing the tour guiding. Loved that..
Get ready to explore a city that never sleeps by hopping on board a New York double decker bus that takes you from downtown, to uptown, and everything else in between! Just hop-on and hop-off the bus with a mobile voucher or printed voucher, except for Night Tour bus route and other add-on activities need to redeem voucher. You are prepared to discover all the landmarks and attractions for your choice of 1 or 2 days, or even just a night tour if you plan on leaving the city during the day. Your bus will stop by more than 30 different stations covering Madison Square Garden, Central Park, The Metropolitan Museum of Art, Little Italy, and more! 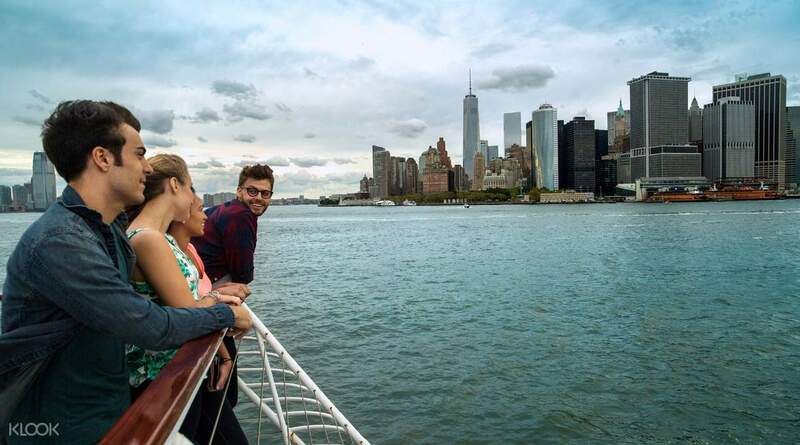 If you opted for the 2 day pass, you will even get to ride on the sightseeing cruise that takes you up close to the Statue of Liberty and right under the Brooklyn Bridge! For anyone visiting New York, this bus pass cannot be missed! It was so fun and memorable experience. There was a tour guide and He was so fun too. It was so fun and memorable experience. There was a tour guide and He was so fun too. It is easy to use for hop on and hop off to explore the city with short period of time. It is easy to use for hop on and hop off to explore the city with short period of time. Very convinient and easy to hop on from Times Square in front of the M&M store. friendly guides. The only thing is I hit my head on the half roof at the upper deck. my fault for moving too fast and not looking. Overall highly recommended. I was unable to use the other vouchers as I became too busy. Very convinient and easy to hop on from Times Square in front of the M&M store. friendly guides. The only thing is I hit my head on the half roof at the upper deck. my fault for moving too fast and not looking. Overall highly recommended. I was unable to use the other vouchers as I became too busy. The Big Bus Hop on Hop off is the best way to see New York if you only have one day. You get an overview of all of the major sites with commentary by some very talented guides. We enjoyed being on top on a beautiful sunny day and were able to travel on 3 of the routes. We did downtown first and got off at Battery Park to get on the Brooklyn loop. It would be nice if that one allowed you to get off but it does not. Back to Battery Park to finish the downtown loop. Then we took the uptown loop after spending some time in Tames Square. We finished in time to visit "Juniors" before see the "Lion King" at 8 pm. A very full day but very enjoyable. 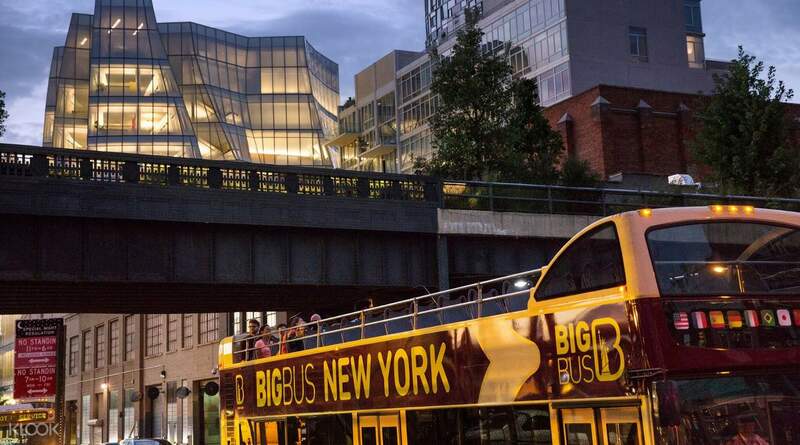 The Big Bus Hop on Hop off is the best way to see New York if you only have one day. You get an overview of all of the major sites with commentary by some very talented guides. We enjoyed being on top on a beautiful sunny day and were able to travel on 3 of the routes. We did downtown first and got off at Battery Park to get on the Brooklyn loop. It would be nice if that one allowed you to get off but it does not. Back to Battery Park to finish the downtown loop. Then we took the uptown loop after spending some time in Tames Square. We finished in time to visit "Juniors" before see the "Lion King" at 8 pm. A very full day but very enjoyable. Traveled alone for this one and very easy to purchase and avail. Was easily recognized by the Big Bus staff and went aboard! Hopped on and off without a problem. Traveled alone for this one and very easy to purchase and avail. Was easily recognized by the Big Bus staff and went aboard! Hopped on and off without a problem. This tour is very informative and is a lot of fun. I highly recommend this tour especially for first time visitor in NYC. This tour is very informative and is a lot of fun. I highly recommend this tour especially for first time visitor in NYC. Good activity, but later found that the end time is 5 pm for all the routes, also there are several other hop on hop off companies at cheaper rates and more frequency, run till late( other than the night tour ). Overall, good. Tour guide was quite knowledgeable, one of them was really funny, gave some funny comparisons while doing the tour guiding. Loved that.. Good activity, but later found that the end time is 5 pm for all the routes, also there are several other hop on hop off companies at cheaper rates and more frequency, run till late( other than the night tour ). Overall, good. Tour guide was quite knowledgeable, one of them was really funny, gave some funny comparisons while doing the tour guiding. Loved that..
Big Bus Hop on Hop off was a great experience. It was a good deal. The tour guides were accommodating and very informative. Wish that the 2 days deluxe package has a lower price. Will definitely refer this to friends when they get to visit New York. We love New York! Big Bus Hop on Hop off was a great experience. It was a good deal. The tour guides were accommodating and very informative. Wish that the 2 days deluxe package has a lower price. Will definitely refer this to friends when they get to visit New York. We love New York! Punctuality of schedule is best appreciated. This service is highly recommended. Punctuality of schedule is best appreciated. This service is highly recommended. Q: Do I have to use the ticket on the day of redemption? Can I redeem the ticket in advance? A: Yes, you must use it on the day of redemption. The ticket will be activated on the day of redemption.